Rodeo cowboy Jerry Ambler is the man credited with revolutionizing saddle bronc riding, taking the competition from a showdown of brute strength to a display of balance and grace. 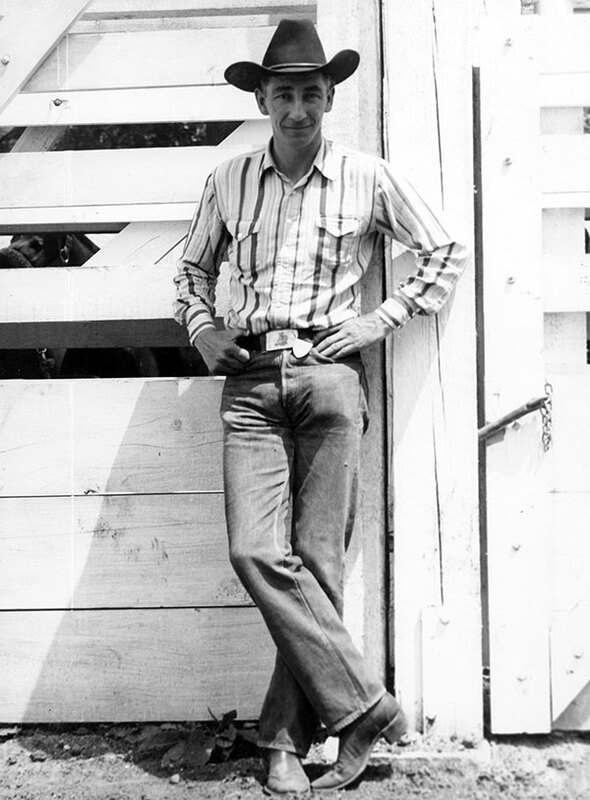 Jerry Ambler at a rodeo in Mollala, Ore., in 1946. Such was Ambler’s fame that Crockett sold “Jerry Ambler”-style bronc riding spurs. 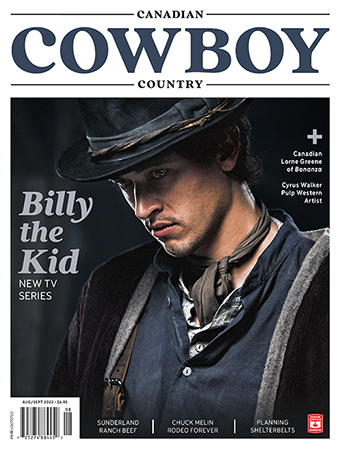 Photo courtesy National Cowboy Hall of Fame/Devere Helfirch. Against his father’s orders, he entered the Birch Lake Rodeo in 1927 and according to the November 1948 issue of Hoofs and Horns, won the saddle bronc day money against experienced cowboys. His father had supplied the stock for the show and Ambler drew a horse that had bucked him off three times before. That win set the stage for Ambler’s life. Ambler’s career took place during an important period in rodeo; a time when rules and regulations began to take root and it became possible for cowboys to make rodeo a career and not just a sideline. A slightly-built man, Jerry rode with a style that was pure balance. By 1932, Ambler had journeyed to New York where he won day money at Madison Square Gardens and second at Boston Gardens. By the time he had won the Calgary Stampede Canadian Champion Saddle Bronc title in 1937, cowboys were trying to introduce some structure into the sport. The 1936 strike during which contestants walked out of the Boston Garden Rodeo positioned them to create the Cowboys Turtle Association (CTA) in 1939. The group, of which Ambler was a card-carrying member #286, sought to improve cowboy earnings and equality in judging. In 1945, the CTA changed their name to the Rodeo Cowboys Association, then in 1975 to Professional Rodeo Cowboy Association. During the 1940s and 1950s, rodeo experienced tremendous growth. 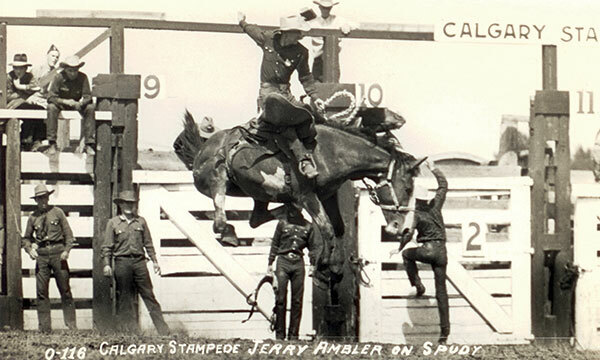 It was a good time to be a part of rodeo, especially for great riders like Ambler who had become the Calgary Stampede World Champion Steer Riding winner in 1941, 1942 and 1943 and the Calgary Stampede World Saddle Bronc winner in 1941 and 1946. Ambler had earned the reputation as one of the smoothest saddle bronc riders around. According to Dayton O. Hyde, author of The Pastures of Beyond: An Old Cowboy Looks Back at the Old West, Ambler was a balance rider who “rode loose instead of gripping the swells of the saddle with his knees. It took balance, not strength.” Jerry’s greatest achievement came in 1946 when he was declared the RCA Worlds Champion Saddle Bronc Rider with a 3,000-point lead over his nearest rival. 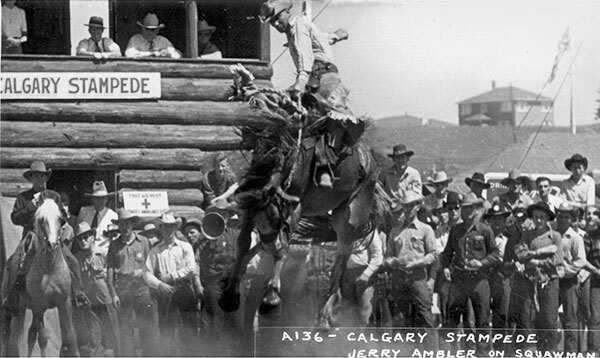 Ambler riding a saddle bronc at the 1947 Calgary Stampede. Note the log announcer’s stand in the background. Photos courtesy Calgary Stampede Archives. Along with his success on the rodeo circuit, Ambler was also featured in movies such as The Boy from Indiana (1950), Fort Defiance (1951) and Bronco Buster (1952) — he even appeared in an ad for Camel Cigarettes despite never having been a smoker. Jerry Ambler was inducted into the Canadian Pro Rodeo Hall of Fame in 1988 and immortalized in an Ian Tyson song in 2002. He is buried in Monticello, Utah.